... presenting an unexpected joyful, festive side of Japan that delights and invites the audience to look closer. 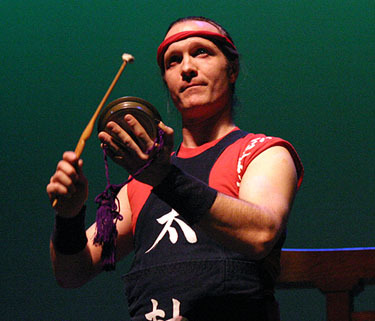 Stuart Paton, Founder and Artistic Director of Burlington Taiko spent most of his childhood in Japan, from age nine months through eighteen years. His earliest exposure to taiko included a first-grade fascination with the drums at an Obon celebration in Tokyo, and learning "Matsuri Daiko" from the composer of the score for his high school drama production. His formal study of taiko began in 1984 during a summer apprenticeship with Grandmaster Seiichi Tanaka, the founder of the first taiko group in North America (San Francisco Taiko Dojo), and he founded the Burlington Taiko Group in 1986 not long after settling in Vermont. 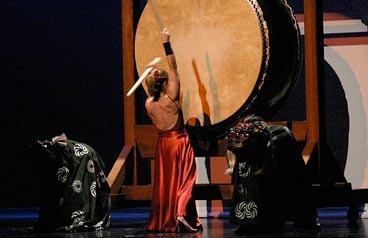 Paton Sensei has established an artistic style for Burlington Taiko that combines movement, rhythm, voice, and the efficient and graceful movement of chi, or "energy," from the player to the drum. 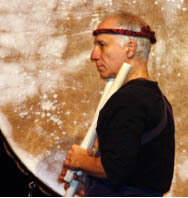 His affection for the group dynamic of taiko is evident both when he performs at the most advanced level, and when he instructs the most novice players. His other hobbies include: reading sci-fi/fantasy/spy fiction, salsa and folkloric dancing, walking though marketplaces, yard sales, and antique shops, and composing new percussion pieces. He is also an active student, teacher, and performer of Cuban and Haitian congas and djembe. I started studying congas in eighth grade (1977) when I was in Japan. My first teacher taught me how to play some traditional salsa parts for congas and adjust them so they could accompany contemporary popular music. I've been studying folkloric conga and djembe drumming since 1987, and am primarily interested in older traditions and learning how to improvise in the context of each of the pieces. I work to have the rhythmic syllables and the language that comes out of me fit the particular piece, whether it's a Rhumba from Cuba or Yanvalou from Haiti. In conga drumming there is a direct connection between my hands and the voice of the instrument; the shape of my hands and the kind of force I'm using gets seven or more different sounds out of the drum. Subtle hand-shapes tune the pitches; thus, it's a more direct connection than stick-drumming. The study and teaching of hand-drumming are both truly enjoyable, life-long pursuits for me. I co-founded and am the artistic director of CompaÃ¡Àa Dancers and Drummers (Cuban-Haitian), Burlington Taiko Group (Japanese), and Orchestra Guayoyo (Cuban-Haitian), and was also the co-founder and musical director for Sambatucada (Brazilian). I have played with Kilamanjaro (jazz), Jeh Kulu Dance and Drum Ensemble (West African), San Francisco Taiko Dojo (Japanese), and the Sklar-Grippo Jazz Sextet. Harry Grabenstein grew up in South Philadelphia where he spent eight teenage summers in the drum and bugle corp developing his ear and movement memory. Also in Philadelphia, he attended Temple University, where he sang in choirs, danced with a small ballet company, and generally hung around the College of Music while majoring in Anthropology. He came to Vermont in 1973, and was a teacher and a member of the Main Street Dance Theater and Ketch Dance Company through the 80's. He began practicing with Burlington Taiko Group in 1989 under Stuart Paton and like most of BTG, has "come up through the system." 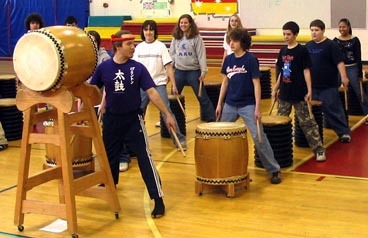 In addition to Paton Sensei, who has been his major source of Taiko knowledge and technique, he has taken workshops with Grand Master Seiichi Tanaka and Kenny Endo Sensei. Harry has been the unofficial rehearsal coach for BTG since the mid-90's and official senpai or "senior member" since 2000.